In addition, service providers are advised to counsel about LARCs during prenatal visits and to offer LARCs in the hospital post-delivery so as to enable women to make healthy decisions for themselves and for their babies about the spacing and timing of pregnancies. Many women do not realize that they can get pregnant before the return of menses, and combining counseling with the availability of LARCs at these key moments may be decisive in helping women avoid an unintended pregnancy. This Trending Topic page draws largely on resources developed for programs implemented in the the United States and United Kingdom but will be useful as reference and inspiration for any country program. They include creative and innovative SBCC materials and approaches to communicating the effectiveness and attractiveness of LARCs, particularly to young women and pregnant and postpartum women. This guide was written to help program managers create postpartum family planning (PPFP) messages to be used in family planning, maternal, newborn, child and other health programs. This is a set of questions and answers about long-acting reversible contraceptives (LARCs) and permanent methods (PMs). The guide is directed at service providers and programs managers and provides information about the methods and how to promote them. This short TV advertisement was created for the India Ministry of Health and Family Welfare - Family Planning division to promote the post-partum IUCD insertion (PPIUCD). This was released on World Population Day - 11 July 2013. The ad shows a couple about to go to the hospital to have a baby. Pamphlet aimed at post partum women recommending the IUD as their choice for family planning. The various advantages of the IUD are outlined. This is a poster designed to be hung in the delivery room of a hospital, encouraging new mothers to have an IUD inserted immediately after childbirth. This is a poster produced as part of a campaign in North Yorkshire, UK. 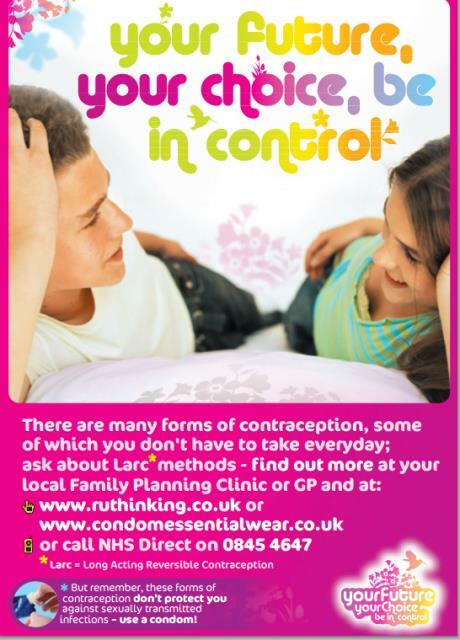 The campaign targets young people who might benefit from using LARC methods. This video is part of a series on the various contraceptive methods, aimed at increasing the participation and knowledge of young men. In this video, a football team in a locker room is spoken to by their "coach" who inspires them to take responsibility by learning about the implantable contraceptive. This is a web page from Teensource, a website sponsored by the California Family Health Council. This page advocates the use of long term reversible contraceptives for teens, as safe, effective, and easy.